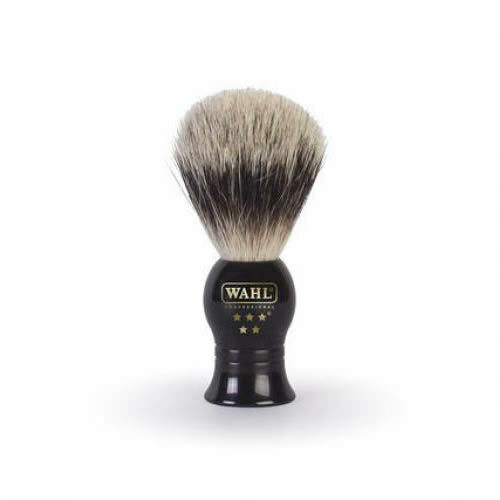 Wahl's 5 Star Boar Bristle Brush is the ideal tool for creating a rich lather and because it's made of 100% boar hair it boasts a firmness that means it helps to lift the hair so your clients get a really close cut. This high quality, handmade product works perfectly when paired with Wahl's own 5 Star Foaming Shave Gel. £15.59 (inc. VAT) Why no VAT? We're a trade wholesaler and quote our prices without VAT to help our VAT-registered customers understand the true cost of a purchase. A wonderful, high quality brush that boasts 100% badger hair and a softness that delivers a luxurious, smooth shave. It comes supplied with a stylish stand that allows the brush to drip dry after each use. An excellent Beard Oil from Wahl that moisturises both beard and skin and contains natural oils of Almond, Grape, Macadamia, Jojoba, Argan, Cedarwood & Sandalwood along with Vitamin E.
Comes in a 50-ml bottle. Stylish ceramic shaving bowl from Wahl that looks great and features integrated lip design to hold brush. Made from ceramic material to aid heat retention. An enriched and moisturising shaving gel with a masculine lemon scent that nourishes and soothes the skin to help reduce irritation. Comes in a 200-ml bottle. Classic invigorating hair tonic that's been infused with willow bark, white nettle and black mulberry, known for their anti-inflammatory and healing properties. Comes in a 250-ml bottle. An enriched non-greasy moisturiser that helps replenish lost moisture, made with white nettle and black mulberry to soothe and hydrate. Comes in a 100-ml bottle. Folding comb with a shave razor design that features smooth, saw-cut teeth that protect the scalp as they massage it. Pocket-sized and smart-looking, it comes supplied with its own keychain. Fantastic pre-shave oil that helps banish irritation, moisturise and protect your clients' skin during the shaving experience. Stylish shave razor from Wahl with disposable blades that mean less irritation and a sharper and smoother finish. Comes supplied with 10 platinum blades and a stylish storage case. Traditional Turkish shaving soap in a stick form that gives a close, smooth shave and moisturises the skin, leaving it soft and supple. Available in a single 75-g stick or as a money-saving box of 12.